Priceless! And, yes, I can imagine the confusion this weather (and subsequent clothing changes) has created for many. Even Nik had a tough time understanding whyhe was going to bed in shorts and a t-shirt tonight instead of his usualy fleecy-footy pj's! I'm reading this thinking, "Well, at least MOM-NOS doesn't have to contend with snow," ... until I got to the end. Seriously, I think I would LOSE. MY. MIND if there was a flake of snow left on my lawn. We're having similar issues w/ clothes these days. Finally worked our way into a short sleeve shirt and no jacket today, but he just won't give in to shorts or bare feet. It's a slow evolution for us, and I always hold my breath hoping and praying that he'll be comfortable in shorts and sandals by the time the temp hits a consistent 80 degrees. But it's a close call, every year. You know, I think Apple would have a supremely confusing time with her clothing choices if there were snow on the ground and warm temps. But we don't get snow here, so that's not an issue. Instead she's just confused every single day and never knows what is seasonally appropriate. LOL. For us it is the cold(ish) weather that causes problems, though, because Apple is always happy in a dress. I hear your pain. It's always the little things that drive me completely batty. I've given up festering about clothes a long while back though. I don't care what they wear as long as they're wearing something. The transition from long trousers to shorts takes approximately three weeks [as opposed to a whole season]. Most valuable lesson learned for me = if I force my son to wear shorts when he needs to wear trousers then he merely ensures that the hems of his shorts meet his socks so as to keep his ankles covered and warm, the fact that everything else is therefore exposed is apparently of no consequence. Glad you ended up having a brill day afterall. I'm wondering where you live, all our snow is good and melted and I live in Maine. And we haven't had a day above maybe 75. Maybe one day was 80 but mostly it's been in the 50s and 60s. Last year however, I left on April 7 and I remember I am pretty sure there was still a good four feet of snow in the front yard that hadn't melted yet. Last year was a cold, snowy year. In previous years it has been impossible for Charlie to relinquish his fleece and gloves and hat and who knows what even when the mercury rose. Today, I put out shorts and he put them on. Didn't even ask for the fleece. Granted, he never wants to wear sandals; always his same Merrell's and short socks. Iced coffee or, perhaps, snow coffee? It's all so confusing to them. M usually has more trouble the other way - wanting to wear summer clothes when it's freezing out. One year we finally had to make a deal - I chose what she wore outside, but she was able to wear whatever she wanted when she came home. I don't even want to think about how high my heating bill was that year as she ran around in spaghetti strap dresses while the rest of us were in thermals. it has taken me two months to convince deion he needs his winter coat...the first day there was no struggle...the sun came out...now its going to take me two months to convince him he doesn't need it LOL!!! but thats nothing, i'm going to try to get him out of thick socks and trainers and into lightweight sandals this summer!!!!! I love the change of seasons because I live in Ontario, and I hate it because of how difficult it is for my kids. It was about 25 degrees here on Saturday, so everyone was in shorts- yesterday we were back to jeans and jackets, and it threw everybody off. Today it's going to be back up to 25, so everyone will be back in shorts and spinning circles again. I'll be glad when the weather just picks something and sticks to it for a while. Now that I'm in charge of what I wear, I will pretty much never wear shorts if I can avoid it (occasionally I have to, so I can wash all my pants). I like having my legs covered. I love how he didn't wear the sweatshirt because he didn't want a red face. Our transition to non-winter clothes and no coat seems to have gone much easier this year than last. Now I just need to hope that we don't get any more really cold spells to confuse the matter. I have to say... what struck me reading this is that of my two children, the one with whom I butted heads over weather-appropriate clothing choices last week was: the neurotypical one. Heh. I totally "get" the Every Style A Memory game--love it! I think we're going to have to play that at Dierks' fan club party in June in Nashville! I'll be sure to give Bud and MOM NOS credit for the idea! 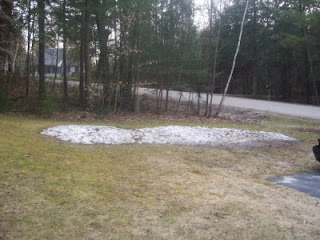 I cannot believe you still have snow in the yard! We had beautiful weather last week but today it was cold (well what passes out here for cold). Glad you and Bud had such a good day yesterday! well, of course he was confused!!! it's SO CONFUSING!! a few days ago it was sleeting and then suddenly, BOOM, 90 degrees! i love the way the day ended for the two of you on that hike, 'what's your favorite'. and how bud left the window open for the shorts. later. he will wear them later. Hey Mom NOS--thanks for posting on the dbcongress blog! To answer your question, indeed, Dierks recorded "House of Gold" at the Grand Ole Opry as one cut on the "How Great Thou Art" compilation CD. All the artists recorded their cut for the album live that night at the Opry. Wish I could have been there! That CD was released February 2008, so it was "short-haired" Dierks! can'e even get it straight, and that is their job! Love the "Game" thing! My kids and I play games all the time! Our favorite one is "The 3 clues game"! You choosea catagory: song, artist, book or movie. Then, one at a time you give 3 clues, allowing guesses after every clue is given. If someone guesses correct, it's their turn, if not, it is your turn again! Simple yet entertaining! Games are a great way to engage and pass the time! We will try the "Deirks" game, but maybe change it to the "Kenny" game! 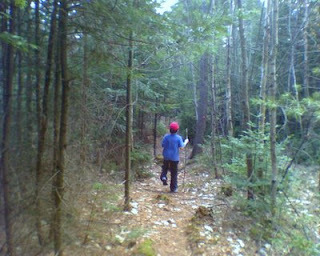 I love the pictures of your hike and the image of him with his ipod singing. The weather has been just nuts these days, moving from cold to hot overnight -- no wonder he was confused, I'm confused. And as for Ice Out 2008 - and as its triumphant winner ;) I look forward to Ice Out 2010! We have the same battles, with temperatures near 90 one day and near 50 two days later. this is such a truism, you could be talking about my son! Wow, snow and 90 degrees, that's amazing. Sounds like you had a real battle over the clothes but at least you had a great time hiking. Must be hard to keep calm! Going from winter to summer clothes.. a battle we have gone through many times. However, the battle was much shorter this year. He only complained about wearing shorts one or two times. It's usually a battle that lasts several weeks.